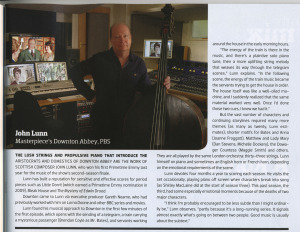 My friends at Emmy magazine asked me to profile three composers, all potential Emmy nominees for their scores for TV series in the 2012-13 season. Here’s the piece about John Lunn, who scores PBS’s Downton Abbey. I also wrote about Christopher Lennertz of NBC’s Revolution and Ramin Djawadi for HBO’s Game of Thrones. Will try to post those shortly.